Frostburg State University is committed to providing a fast, safe, and secure network. Connection access to the fiber-optic backbone can be made by "plugging in" to the university network (wired) or through wireless access. The network account is the core of computing access at FSU. It gives managed and secure access to the campus network and FSU computing resources. The FSU network account consists of an FSU username and password. You will use your FSU username and password to log in to any computer attached to the University's network, including all academic lab computers. Access to most University computing systems & services, including email, Canvas, web servers, network storage system, PAWS and the student network registration system, is controlled through your network account as well. All employees and students are automatically given a network account, with a unique username, when they are employed by or enrolled at FSU. You can manage your FSU network password anytime using the Password and Account Management tools. The first time you log into your FSU Network account, you will be asked to enter your username and set up identity security questions and answers. These will allow you to retrieve, change and reset your password in the future. At FSU, a single password is automatically shared across multiple system including email, Canvas and PAWS. Therefore, when you change your password for one of these services, your password will automatically change for all of the others. FSU requires users to update their password every 60 days. You can do this using our Password and Account Management tools. When creating a new password, rules must be met to ensure the complexity and security of the password. Your Password must be a minimum of eight characters/numerals. Your Password cannot contain all or part of your username. Password history will be enforced which means that you must use a least 10 unique passwords before a password can be reused. If an account has six consecutive failed login attempts, the account will be disabled for a period of 15 minutes. If an account has not been logged into for over 60 days, the account will be disabled. Go to the Password and Account Management page to reset your password. If you have any difficulty, contact the IT Help Desk. Passwords expire every 60 days. When you attempt to log in to PAWS, you see the message "Your User ID and/or Password are invalid or your Password has expired". Solution: Click on "Click Here to Change Password" to go to the page where you can change your password. When you attempt to log in to the email system, you may see an "Access Denied" error message. Solution: Go to the Password Management page and change your password. When you attempt to log in to Canvas, you see the message "Valid authentication credentials were not provided". Solution: Click on "Reset your password at the FSU Password Change page" to go to the page where you can change your password. When you attempt to log in to the FSU Wireless Network, you see a Change Password window with the message "Your password on the remote network has expired". Solution: Following the instructions in the Change Password window to enter and confirm a new password. Then click OK. See the online instructions for Student Wireless Logon with Expired Password (PDF) for complete details. All FSU students and employees must use an FSU network username and password to gain access to the FSU network and resources. If you need help accessing your FSU account and email for the first time, please contact the IT Help Desk. FSU network accounts are created when you are enrolled at FSU. Your FSU username and password will be emailed to the home email address you provided to FSU. Additionally, you can use the Find My Username utility found below to look up your username. Network and email accounts are created when you become an employee at FSU. Your Department Chair and Administrative Assistant will be contacted when your account is ready. Go to FSU's Password and Account Management page to set up your unique password and identity account security. You can continue to manage your password regularly in the Password and Account Management Portal. Use this tool to search for the FSU username assigned to you. Where can I find my FSU ID Number? All Frostburg State University employees are assigned an employee ID number. You can find this number on various official university documents such as your timesheet. If you have an ID Card like the one shown below, your Employee ID number is displayed as a 7-digit number just below your picture. The example below applies to both employees and students. Your employee ID number is also viewable from the "Personal Information" page in PAWS. 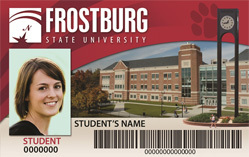 All Frostburg State University students are assigned a student ID number. You can find this number on various official university documents and even your student ID card. The example below shows a typical student ID card with the student ID number directly under the word STUDENT (Example ID Number: 0000000). You can manage your password anytime by using FSU's Password and Account Management tools. FSU provides free Internet access for all students on campus. To access FSU’s free Internet, you must register your computer on the network. Attention Students. You must register your computer and other devices on the FSU network to gain access to FSU network resources and the Internet. This is required for both wired and wireless access. At a minimum each student computer must meet the following conditions before it can be registered and can obtain an active internet connection. A few seconds after the installation is complete, you will receive a web page informing you of any steps required to ensure your system's security. If your system is already in compliance with FSU policies, you will be free to access the web immediately. Users should review the FAQs and process-specific questions and answers below. Additionally, help pages are displayed throughout the registration process. Finally, users can contact the FSU IT Help Desk for assistance. How often do I need to register my devices? Student computers and devices must be registered each semester, or if your device is away from campus for an extended period of time (more than a week or so). What types of devices may be connected to the FSU network? Phones, iPod touch, basically any device that connects to the wired or wireless network. What if my device to found to be unsafe? If a computer is unsafe it will be quarantined until the necessary updates have been applied. You must install a policy key in order for the network access control device to work properly. This policy key is not invasive, and only verifies that the required software is installed. When you are not on campus the policy key does not monitor your computer. If you do not wish to install the policy key, you do not have to. However without the policy key you will only be able to access essential Frostburg State University, Microsoft, and anti-virus/anti-spyware websites. Any time you try to access other websites you will be redirected to the page asking to install the policy key. If you uninstall the policy key while still on campus, when you attempt to access non-FSU websites you will be redirected to the page asking you to install it. If the anti-virus, anti-spyware, or operating system patches are not kept up to date or are uninstalled, or your computer is detected generating activity that may be related to a virus or spyware infection, you will be redirected until your computer is compliant. You can find out more about Policy Keys below. What am I allowed to access when quarantined? Remediation services like anti-virus / anti-spyware software, and internet sites such as Microsoft Windows Update Services, along with essential FSU resources. These include the Frostburg State University website, PAWS, Canvas, etc. Can I download operating system software security updates while quarantined by Impulse? Yes. Any Windows Updates your system needs can be downloaded and installed while you are in quarantine mode. The same applies to virus definitions from most of the major anti-virus providers and to anti-spyware updates from Microsoft, SpyBot and Ad-Aware. When I run Windows Update Services, I get a message stating that the product key used to install windows is invalid. Why? Windows Update will fail if your Windows Operating System is not properly licensed. You must have a legal copy of the operating system to connect to the university network. Please contact Microsoft or your PC manufacturer with questions. Do I have to use the Impulse Policy Key? Yes. All Microsoft Windows PCs are required to use the Impulse Policy Key to ensure a safe computing environment for all and it is required for network access. What happens if I uninstall the Impulse Policy Key? You can uninstall Impulse Policy Key at any time; however within minutes you will then be unable to access the internet. You will be required to reinstall the Policy Key as if you are a new user to gain internet access to anything but essential FSU resources. Is the Impulse Policy Key compatible with my system? Yes. The Impulse Policy Key is compatible with and required for Windows Systems. At the present time, Macintosh, Linux, and FreeBSD machines are not required to install the Policy Key. I have an older gaming console that does not have a web browser. How will I connect to the internet? You may enter your FSU credentials on any game console with a web browser in order to connect to the internet (you will be automatically redirected the first time you connect). If you have an older game console without a web browser, please contact the FSU help desk at 301.687.7777 for assistance. What does the Impulse Policy Key actually do? The Impulse Policy Key continuously validates that your system has the minimum security software running and up-to-date as per the FSU's acceptable use policy. To be granted internet access, you are required to have Windows Automatic Updates running. You must also have anti-virus and anti-spyware software installed and running with the most current definitions available. You are also prohibited from using P2P file sharing applications to download copyrighted materials. The Impulse Policy Key is part of Frostburg State University’s effort to help you keep your computers as free as possible from viruses, spyware, and operating system security holes. Machines protected in this way generally perform much better and require much less downtime due to damage caused by malicious software. Ensuring that communication from malicious software does not flood FSU's internet connection, resulting in much slower connections for legitimate users. Restricting the P2P filesharing of copyrighted materials that could cause lawsuits to be brought against you from the recording industry, and also which would otherwise consume an unfairly large share of FSU's bandwidth, again resulting in a slower connection for the majority of users. What if my system is not up-to-date? If your system has been determined not to be up-to-date, your computer will be "quarantined." While quarantined, you will still have access to academic resources such as the www.frostburg.edu website, PAWS, and Blackboard, as well as to update servers for your operating system, anti-spyware and anti-virus software. Your privacy is important to us. The Impulse Policy Key scans only for Windows update services compliance, anti-virus and anti-spyware status and certain P2P file sharing applications. No user data is collected or stored. When you register your computer by running the software requirements test, you are making yourself (or any guests using your computer) responsible for your network and internet connection and you are agreeing to abide by the FSU Responsible Computing Policy. As a resident student, you want to start computing right away. Residence halls have a wireless access point installed in every room. Each access point also has three wired ports available on the bottom of the access point. You will need to bring a computer and an Ethernet cable to connect to the wired network port in your room. You will need to provide your FSU username and password to gain access to the network. For wireless requirements, see Wireless Network information below. As a faculty or staff member, someone in the Office of Information Technology will set up your network access. You may also request assistance through the IT Help Desk. The university has a wireless network in addition to the standard wired network. Faculty, staff and students can connect to the university’s wireless network by connecting to WiFi@FSU and entering your provided network credentials. Computers must be equipped with a wireless network adapter (802.11 g/n/ac) to connect to the wireless network. We recommend purchasing a dual band wireless adapter (2.4GHz/5GHz) as this will enhance your wireless computing experience. To use devices such as televisions, gaming systems or other devices that do not have a web browser on our network, you must first register these devices. Once registered you can use the psk@FSU wireless network or you may plug the device in to the port on the bottom of the access point mounted in your room. View the Device Registration instructions (PDF). Two (2) common ways to solve many problems related to wireless access are listed below. Please try these first before seeking further assistance. Make sure you updated your password on your mobile device. You must manually change it on each mobile device in addition to on your computer. If necessary, you can get further assistance from the IT Help Desk. All residence halls have full wireless coverage. See the map below for complete campus coverage. The Office of Information Technology at FSU provides a secure VPN (virtual private network) service that allows faculty, staff, students, and sponsored users a quick and easy way to connect securely to the FSU network from external, off-campus locations. Any off-campus user that needs a connection to any FSU network information or resource must connect through the VPN to get the necessary network access. You will need to download and install a small application. If you need assistance installing or connecting to the VPN software, staff at the university IT Help Desk can assist you. See the VPN Instructions (PDF). You must have an anti-virus program installed and running. The definitions must not be older than 8 days. Full VPN functionality is supported through Microsoft Internet Explorer and Macintosh Safari web browsers. Other browsers may be used but you may lose some functionality and they are not supported by the Office of Information Technology. Full VPN instructions (PDF) are provided on how to make the off-campus connection from your computer. You may also contact the FSU IT Help Desk for assistance. Frostburg State University provides free access to the Internet for its on-campus students. Each room is equipped with an access point that allows both wired and wireless connection. Each access point also has three wired ports available on the bottom of the access point. You will need to bring a computer and an Ethernet cable to connect to the wired network port in your room. The FSU Bookstore has ethernet cables for sale if needed. For instruction on how to connect to the network, both wired and wirelessly, please see the Wired & Wireless Access section above. There are many rules and laws governing usage of the Internet. Don’t jeopardize your future by violating these guidelines. It is essential that you read the policy on Responsible Computing at Frostburg State University (PDF) so that you will know how to conduct yourself on the Internet. Visit the IT Help Desk page for more information about getting connected to the University's Network and internet. Guest of FSU may access the FSU wireless guest network - guest@FSU - from a computer or mobile device. This network requires a guest ID and password.